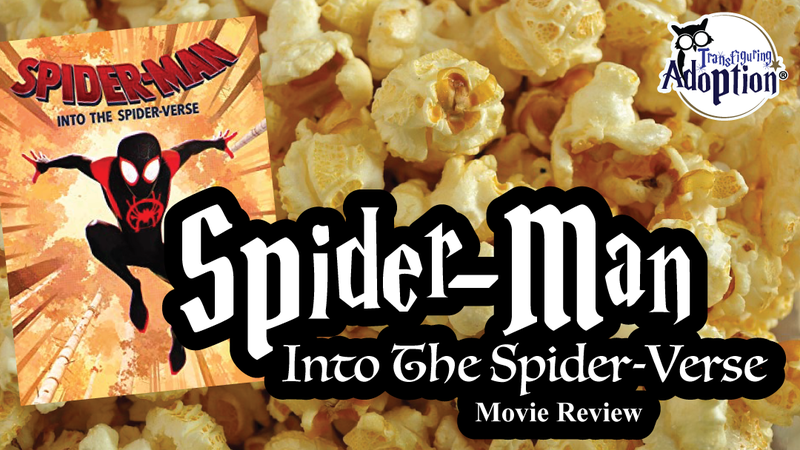 This movie follows the life of teen, Miles Morales, as he is trying to find his identity while navigating various changes including becoming the new web-slinging Spider-Man. The film takes hip hop music and a new style of animation along with an engaging storyline to weave together a tale which undoubtedly had many people running to the box office. As with most movie this piece was not created specifically for use for foster and adoptive families. However, it does pose topics which could bring about healthy conversations for upper middle-schoolers or even high school students. How Is This Relevant To Adoption & Foster Care? While the main character, Miles Morales, lives with his birth family, he still struggles with finding his identity as he is no longer attending public school where he is well-known and loved. Instead the teen is attending a seemingly more challenging private boarding school where he appears to be at the bottom of the popularity barrel. In the midst of trying to figure out his “normal” teenage identity Miles is bitten by a radioactive spider and must factor his forming superpowers into the identity equation. Many children coming from the foster care system or adoption struggle with the issue of identity. The topic of identity can be complex but this movie can help you to broach this topic with your child. Forming relationships and having good role models can be tricky for anyone. Children from foster care and adoption backgrounds, who may find themselves struggling with good self-esteem or in the midst of long-lasting, stable relationships, can tend to throw themselves into any relationship which gives them attention. This might mean a child has a one-sided friendship with someone at school who is using them for a selfish purpose or a child may befriend someone who is making unhealthy/unsafe choices as long as they are getting the attention they crave. 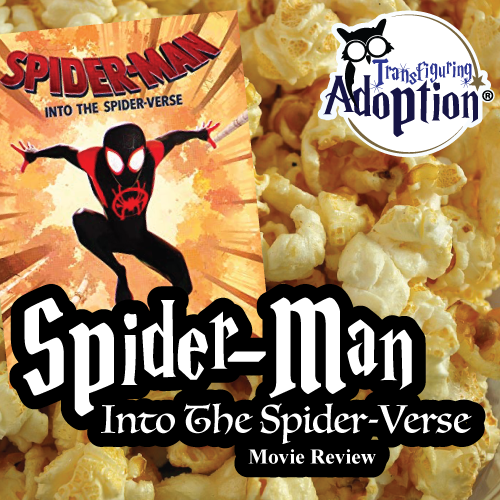 In this movie Miles Morales feels as though he cannot connect with a father who, in Miles’ eyes, is squashing his talents and identity. Instead, Miles finds more of a kindred spirit with his uncle, who makes questionable life choices but shows an interest in Miles and encourages his talents. This movie will allow you to talk with your child about the qualities they should look for in a role model, a friend, etc. Children who have been through the foster care or adoption process have undoubtedly experienced loss in their life. Reliving the emotions of this experience is naturally traumatic and triggering for hyper-vigilant behaviors. This film portrays several characters explaining the loss or death of a loved one. In each case the loss was traumatic for the character. This includes the death of one of the Spider-man characters as well as the death of the main character’s uncle. As your child’s stable caregiver, it will be up to you to ascertain whether this type of movie will be triggering for your child or not. After watching the film, it would definitely be good to be available to discuss the loss of a loved one with your child. As discussed above in the “Role Models” section, it can be difficult for children from foster care and adoptive backgrounds to form healthy relationships when they were forced into a world of instability. In this film Miles struggles with leaving his familiar school and territory to attend a private school where he is the odd duck. Through the course of the storyline Miles is able to meet various people who are going through the same experiences as himself and thusly, understand him. After watching this movie, it would be worth talking to your child about the qualities that both of you saw in the movie that made for good friendships. Many children from foster care and adoption find it a challenge to piece together their identity when they find they have information missing from their life story. Throughout the movie Miles is attempting to discover his identify through normal teenage trials. However, after becoming the new Spider-man, he is thrust into a situation where he is lacking a lot of knowledge and very few people can actually relate to his situation. This movie allows the opportunity for you to talk with you child about what “discovering identity,” even means. You may also take a look at the movie together to see how Miles figures out his identity. Your foster or adoptive child has experienced loss in their life. The characters in this film will talk about the death of loved ones and the audience will experience the main character witnessing the death of his uncle – not to mention the death of the a Spider-man character at the beginning of the film. We suggest watching this movie before your child if you know that death or characters experiencing loss will trigger your child about their own past loss. Naturally, a superhero movie is going to feature heroes and villains fighting. However, some children from traumatic backgrounds may have a difficult time separating reality from fiction. Parents may want to view this movie prior to their children if they know their child is prone to acting aggressively or gets overly ramped up from seeing fighting/violence in movies. Also, it is worth noting that any scenes that may get adrenaline pumping can signal your child’s body to unconsciously remember past trauma that also may have cause a good flow of adrenaline. While most children will be able to pull away from this movie understanding that it was fictitious and created for entertainment purposes, it is worth noting that the main character and hero does partake in such actions as defacing public property, sneaking out of the house, and defying his parent’s wishes. How would you describe Miles at the beginning of the movie? At the end of the movie? How was Uncle Aaron a good role model? A bad role model? How as alternate universe Peter Parker a good role model? A bad role model? Every spider-being lost someone close to them. How did losing her best friend affect Gwen? How did Peter’s loss affect him? How did Miles’ loss affect him? Why were Gwen, Peter and Miles seemingly able to become friends so quickly? Miles snuck out of his dorm to visit his Uncle Aaron even though he knew it was against the school rules and he knew his parents wouldn’t want him to. He really seemed to need to talk to his Uncle though. Did Miles make a good choice or a bad choice going to visit his uncle? Why do you think that?